SKILLS Development Scotland is pleased to announce that pupils from St. Andrew’s High School and Bearsden Academy have beaten off competition from over 50 schools from the West and South West of Scotland. The competition, designed as a world-of-work initiative, was sponsored by leading global custodian and securities service provider, BNP Paribas Securities Services, and delivered in collaboration with Skills Development Scotland. Hosted in Glasgow’s famous Mitchell Library, the challenge focused on teaching pupils how financial markets operate and helping them develop their applied maths skills and business understanding. 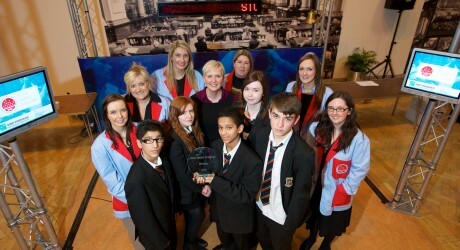 Coatbridge’s St. Andrews High stormed the trading floor at on Wednesday; emerging victorious with a record breaking fund of £223,800. Bearsden Academy topped Thursday’s challenge with £58,100. Scottish Government Minister for Skills and Learning, Dr. Alasdair Allan, said: “Having met some successful young players of the stock market, I have seen for myself the value of training our young people in the skills needed to succeed in the financial sector. Employees from the sponsor BNP Paribas participated as ‘traders’ at the event, making the whole experience even more accessible. Participating schools also got a free year-long licence for the Stock Market Challenge online resource. Jennifer Parihar, head of Position Keeping and Control at BNP Paribas Securities Services, also commends the educational aspect of the game. MEDIA RELEASE posted by Skills Development Scotland. You too can post media releases (aka press releases) on allmediascotland.com. For more information, email here.